friends | Small, but valuable. Honestly, this made me laugh for at least a minute straight when I saw it last night. I just kept looking at it again and laughing some more. It’s so true. Sometimes when I spend time with new-to-me people, I feel exactly like sweater dog. And real life me? Well, real life me is definitely scouring the fridge for a good bite to eat with a frenzied look on my face. Nailed it. Aren’t old friends wonderful? I like to think of new friends as potential old friends, so they’re all one big happy family from the start. There’s still that desire to seem normal and put together for a while though. Then over time you remember how tiring and pointless it is to try to seem put together when you aren’t. And there you are, being ridiculously you in front of friends. 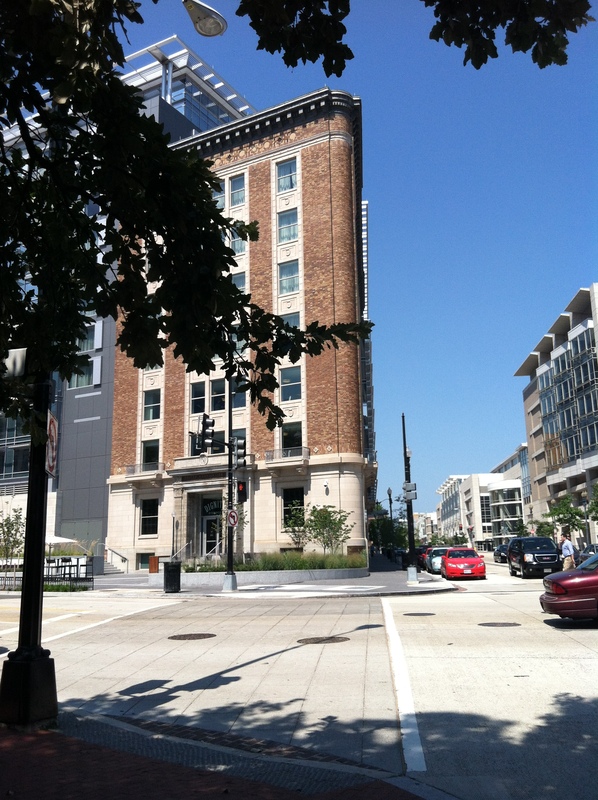 We found ourselves in Washington, D.C. yesterday (for a whopping total of 4 hours), and I soaked up as much city architecture as possible. We decided it would be a good test run for Scott’s old (and much beloved by Scott) sandals. Will they stand up to hikes and treks and adventures in Europe? Turns out the answer to that is a resounding no. A few miles into our 5.2-mile D.C. adventure, Scott’s right shoe took a turn for the worse. It was about 25% unglued before the walk, and it’s about 75% unglued now. The fun thing about the sad shoe event? Well, Scott was walking around the city like he had a really weird tic for the remainder of our adventure. Not fun for him, but very entertaining for me. I’m proud of my man for letting me giggle at his walk for the remainder of the afternoon. Intermittent giggling, anyway. He’s a good sport. We also met up with a friend we haven’t seen in about a year and a half, and it felt like a giant hug. I should talk to old friends more often. Consider this an apology to all of my friends. I know I’m bad at calling you, and I’m trying to get better at that. I like you, I really really like you. A great friend got married near Ithaca, New York last weekend, and Scott and I had the pleasure of celebrating with her and her now-husband. It was gorgeous, with fall leaves everywhere and the general awesomeness of small towns and new places. 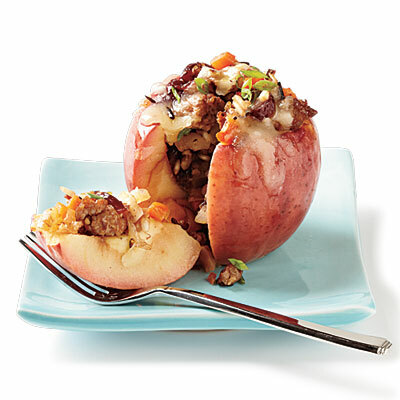 Monday: Savory Baked Apples (om nom nom!). I did use ground turkey instead of sausage, just because we already had some ground turkey in the freezer. When all was said and done, Scott and I decided that while this recipe was freaking awesome, we would simplify it a bit next time. Instead of the stuffed apples thing, we would chop up a few apples, include them in the stuffing when it says to add apples, and there you go. No time-consuming apple-coring and emptying. No pre-baking. No “Is this the right apple to stuffing ratio?” questions. It was genuinely delicious though. 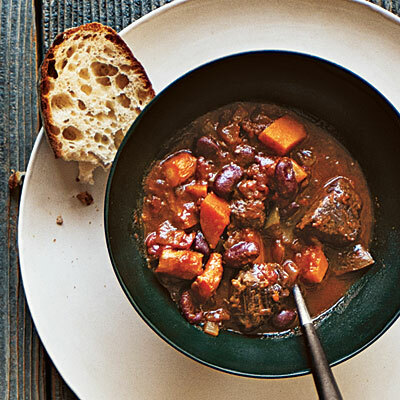 Tuesday: Beef and Butternut Chili (om again). This one was delicious exactly according to recipe. I mean, truly delicious. There was a ton of flavor, the beef was tender, and little birds sang into the window as rays of evening light shone into the kitchen. I even had time to clean up most of the dishes while the chili/stew/awesome simmered on the stove. 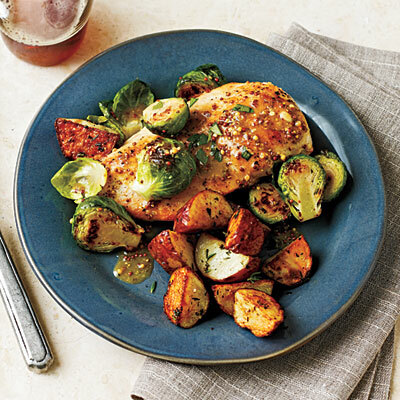 Wednesday: Chicken with Brussels Sprouts and Mustard Sauce. This one was a tiny bit heavier on the veggies than the other recipes, which was good. And I used boneless chicken thighs, which made the dish less expensive (bonus). It was really good, but after the incredible flavors from the first two recipes, this one wasn’t quite as perfect. Good. Really, really good, but not amazing. Oh, I also added some oven-roasted rosemary potatoes. My stomach feels great about this week. Thanks, Cooking Light! I’m not stealthy, so I will never be a cat burglar. With that cleared up, I’ll tell you a story. We have some friends nearby who are in that special friend category where you’ve lost count of who cooked dinner for whom the most (or brought drinks or took care of the other people’s dog, etc.). It’s pretty nice when you get there with friends. I don’t even have to tidy up before they come over. Ooh, aah! Long explanation short, we’re dog-sitting for Spot for a few days, which is always fun. He and Peanut get along really well, and he’s generally a great dog to have around. In addition to a lovely personality, Spot possesses a dog door. Or his house possesses a dog door, so he didn’t need a dog-sitter until this morning. I went over after hitting up the post office, as planned. But the situation got a tad bit complicated when I saw a car in the driveway. [Dramatic music starts playing in the background.] That’s right, there’s a roommate home at the casa de friends. I’ve met this roommate several times, and I know he would recognize my face if we ran into each other. I’m not entirely sure he knows my name, however. We’re definitely not the type of friends who can sneak into each other’s houses and steal each other’s dogs for a few days. Despite the car situation, I try opening the front door to retrieve Spot. No luck. I try the other doors with the same result. Then I take the next responsible step and ring the doorbell. I feel sheepish about that option, because I know a few things about this guy’s sleep habits, and there’s a good chance that he’s still asleep. No answer. Well, no human answer. Spot barks at the door a few times. Too bad he doesn’t have opposable thumbs. 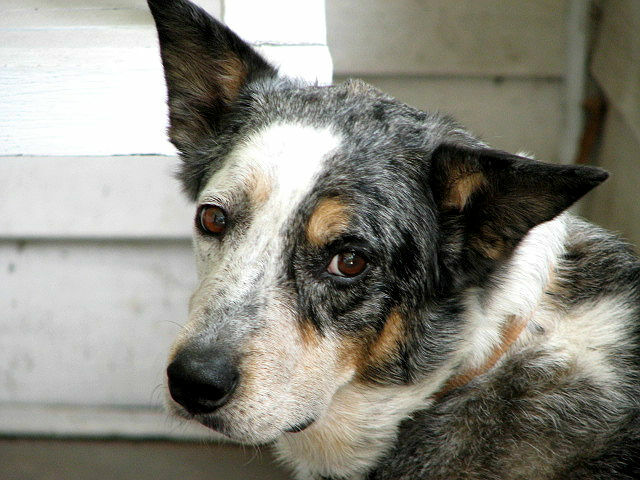 Spot is also sad that he doesn’t have opposable thumbs. Then I resort to the awkward option. I crawl through the doggie door in the laundry room. I wouldn’t normally feel weird about that if I needed to get into this particular house, but the roommate thinks he’s on his own at the house for a few days. I would never crawl through the doggie door of a random college student’s house. Never. So what if I get inside and he’s playing video games on the couch of his own house, wondering how I got into said locked house when he purposefully didn’t answer the door?! Fortunately, there’s no sight of any variety of roommate–sleeping or awake. Spot looks glad to see me, and we get out of there with a huge sigh of relief (Spot because he doesn’t like to be alone and prefers to be not alone with an awake person, me because I escaped the house unnoticed). I have my fingers crossed that the roommate won’t wake up and freak out that the dog is missing. I might have forgotten to leave a note in my rush to leave. I did accomplish my goal, however, as evidenced by the two happy dogs napping in my living room. I’ve been working on an art project for a few days. It was really a glorified excuse to think happy thoughts about a friend who recently had a baby, but that’s okay. I figured that if the project went well, it could be customized for other folks and sold on my (someday soon to be opened) Etsy shop. 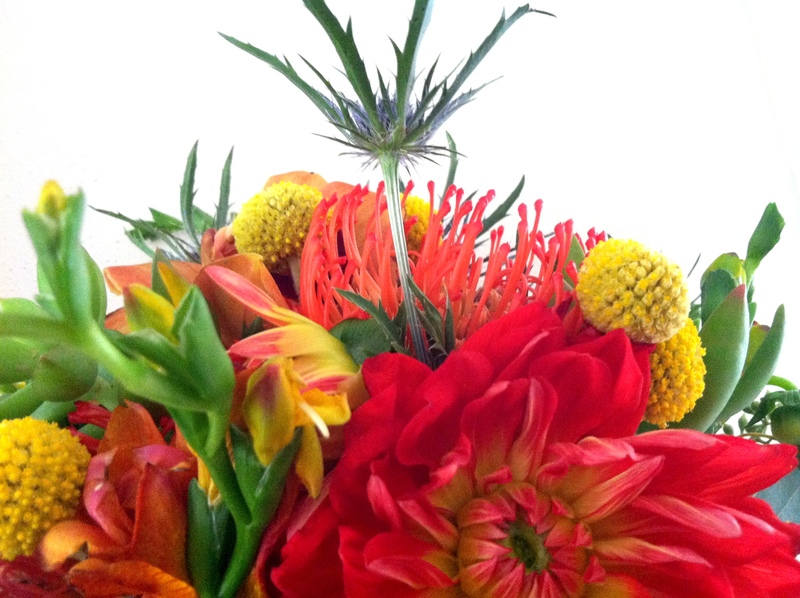 The original efforts for this project were flower-centric, but something about that didn’t feel right. While Ellie’s mom loves nature and flowers and such, she’s more of an animal rehabilitation/hiking/kayaking/loves-taking-care-of-people kind of person than a fancy-floral-arrangements kind of person. She spent lots of summers in Africa, too. 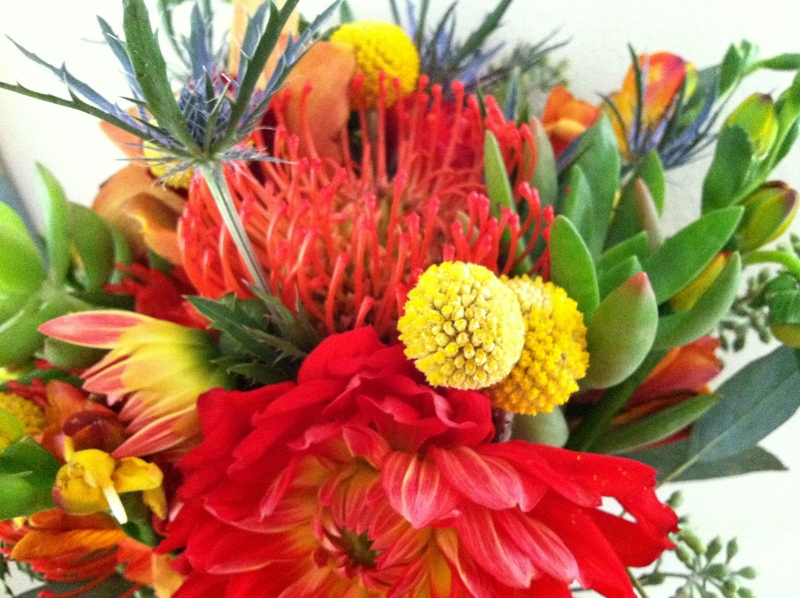 So what’s better than flowers and a baby’s name? 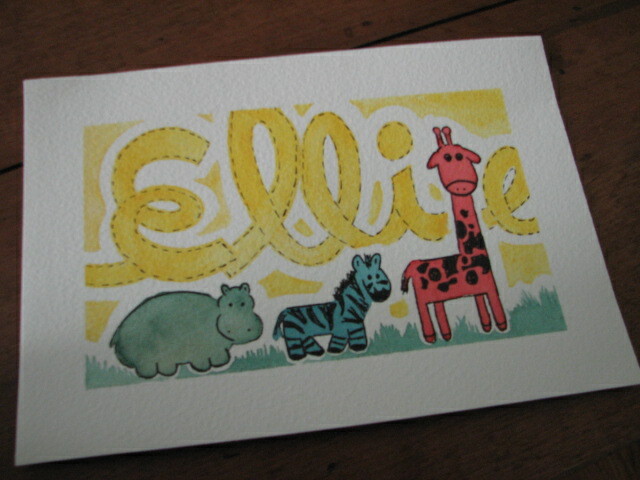 Animals and a baby’s name! 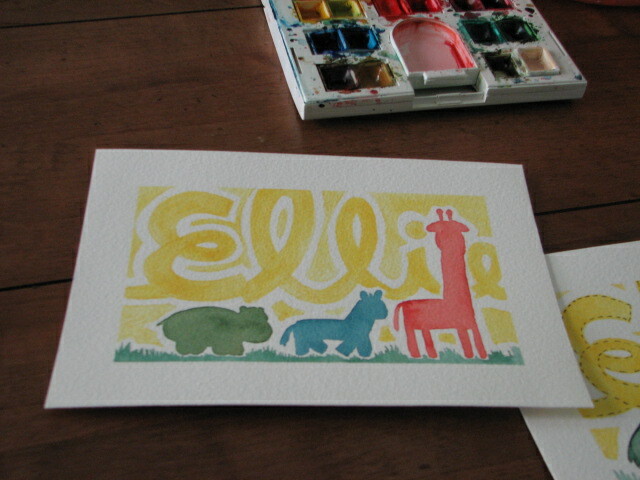 Unfortunately, I’m not in the habit of painting African animals. 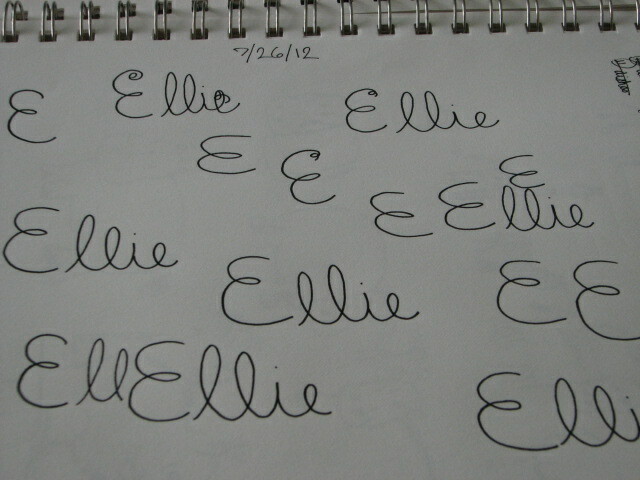 That meant some practice with basic drawing and cursive E’s (not really in my repertoire, either). Cool, I can write in cursive now. 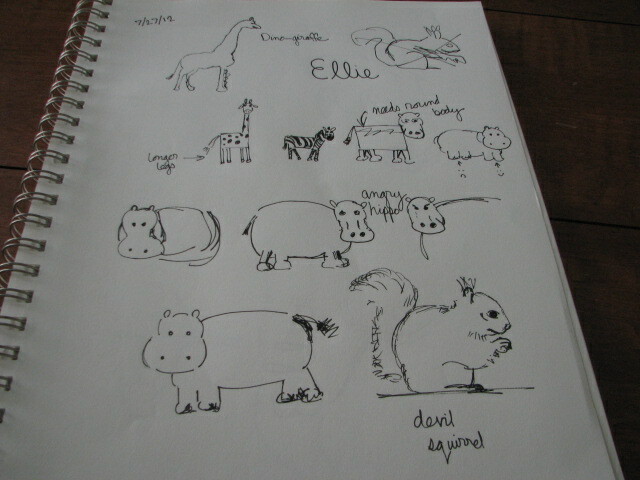 Not sure how the squirrel snuck onto the next page. And then it was time to get to the fun stuff. I like that Ellie’s name is an important part of the painting, but it’s a little bit subtle in the sky (more subtle across the room than in this picture). Because I liked the painting a lot, I got nervous about doing the ink drawing layer that I had originally planned for it. 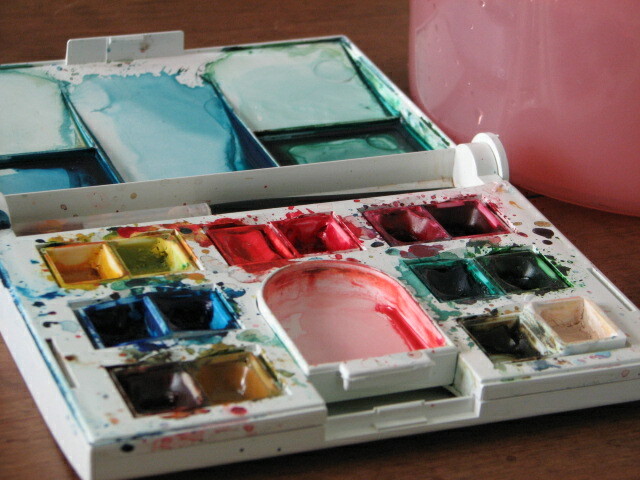 Enter painting number two, which is more or less the same as the one above, with the additional layer of ink drawing on top. So the advantages of the second version seem to be that the animals have more personality, and the name stands out more. Despite those advantages, I think I like the plain version better. What do you think? Last week finished with a bang in addition to July 4th fireworks. I had the pleasure of going to Denver to meet the son of one of my awesome college roommates. He’s two and a half (the son, not the roommate, who is female), and it was high time that we met. Plus, I wanted to hang out with his mom, and his dad is great, too. It was just an overall win. Awesome conversation with Candice–you know, the kind of conversation that is really difficult to achieve over the phone or through snail mail. Time hanging out with Matty, who is cute and fun and smart and everything a parent would hope their child would be. A good viewing of The Princess and the Frog, mixed with more great friend conversations and some playing with blocks. Dinner at David’s restaurant (husband of said college roommate, also a friend from college) to sample the awesome work he does every day as a chef. It was delicious, so if you ever find yourself in Denver, let me recommend Lou’s Food Bar. You can find an official review of the tastiness here: New York Times review. And you can check out their menu here: Lou’s website. 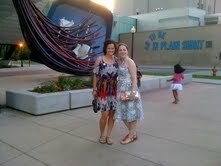 Girls’ night out at the Yves Saint Laurent exhibit at the Denver Museum of Art. You’re going to get pictures at this point. Friend time in front of the giant broom at the museum. 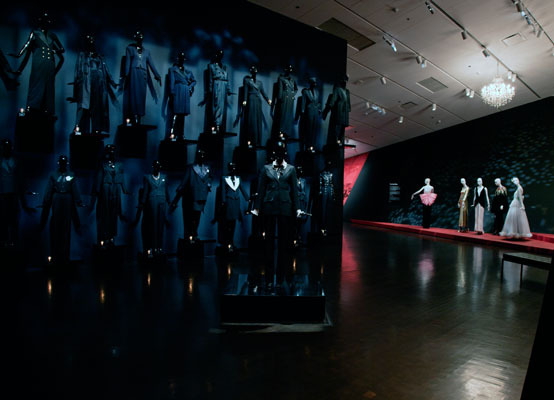 Wall-o-tuxedos, glimpse of evening gown display, and a vague idea of the awesomeness. 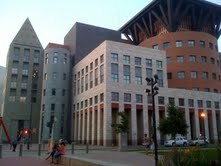 It was a lot better than any picture can credit, and it was followed up with some more quality friend time in downtown Denver. 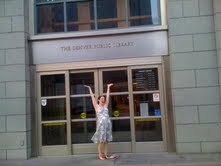 Candice and I decided that the Denver Public Library has an awesome building. Candice proposed that it would be a good place for me to work. And then it was back to the house for some sleep, another half viewing of The Princess and the Frog (I totally support Matty’s desire to watch favorite movies over and over again, since it’s something I have done a time or two myself), a visit to a fantastic bookstore and an arts festival, and a drive to the airport. There’s no time like old friend time, so I was a happy camper on the way home to Virginia.